As Halloween approaches, our thoughts can turn to creepy things that lurk in dark, dank places…like mold! But more than just being a scary, strange-looking creature, mold can have serious health impacts for workers who are exposed to large amounts of it. Though mold may not be the most-toxic or lethal substance in many workplaces, it’s still vital for employers to remember the dangers it can pose. OSHA, Health Canada, and the Centers for Disease Control all advise on potentially major health risks that can arise from mold exposure, and all provide explicit safety recommendations for those working with it. According to the CDC, typical physiological reactions to mold exposure can include nose, eye, and skin irritation. However, workers exposed to large amounts of mold can have more severe reactions, including fever and shortness of breath. In extreme cases, those exposed may develop infections in their lungs. Asthma sufferers, those with impaired immune systems, and people with mold allergies are also at increased risk of a severe reaction. 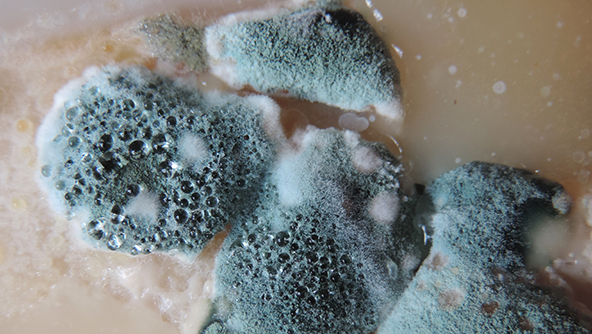 Molds are naturally-occurring fungi that can be found anywhere in the U.S. or Canada, at any time of year. There are about 1,000 species of mold in U.S. alone. In addition to posing significant health risks to people, mold can — over time — damage whatever it grows on. In extreme cases, mold has caused permanent structural damage to wood framed buildings. Because it requires water in order to grow, a good first step in preventing mold is keeping interior areas as dry as possible. This can involve repairing leaks as soon as possible, replacing broken pipes and making sure they are sealed, and keeping the overall interior humidity low. If an area is temporarily flooded, it is important to dry the area as quickly as possible to prevent mold, because it can begin to form in as little as 24-to-48 hours. Health Canada also provides recommendations for environmental and workplace encounters with mold. There is currently no federal standard for the safe amount of mold or mold spores to which a worker can be exposed. However, this is not because mold is safe. As OSHA notes on its website: “Scientific research on the relationship between mold exposures and health effects is ongoing” and “Potential health effects from mycotoxins [mold metabolites] are the subject of ongoing scientific research.” In the meantime, OSHA strongly recommends that safety and PPE best practices be followed. MSDSonline’s suite of on-demand training solutions contains modules on Respiratory Protection, PPE, Eye and Face Protection, and other trainings directly salient to the safe workplace handling of mold. For more information on MSDSonline’s suite of trainings, you can access our online catalog here.